I will not be able to join the class today. However, I have a couple of challenges to offer. Please review the following images found online and determine how they are tatted. Good luck. Notice the gracefully curving picots joined from one chain to another. How did Grace do that? This challenge is by Ruth Perry. See how she takes a celtic picot and gives it the look of a butterfly? 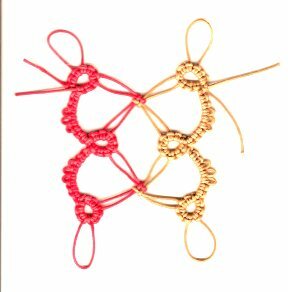 And how did Ruth Perry get these picots knotted up in the center? ?